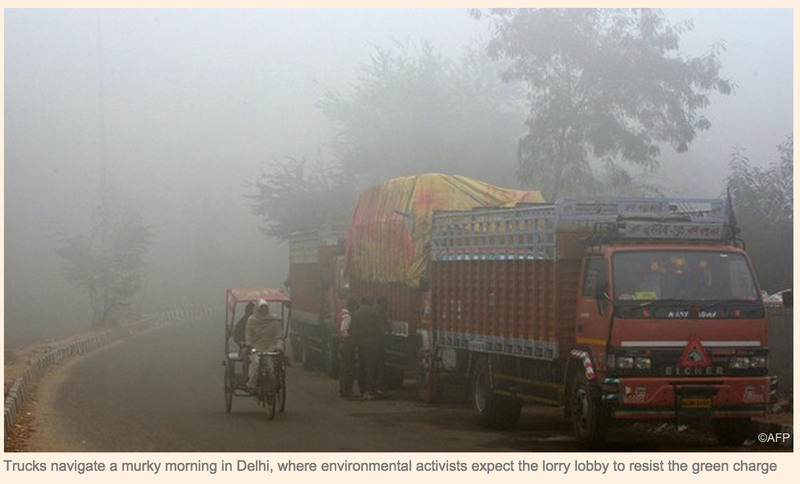 “A green tax is to be imposed on commercial trucks entering New Delhi in a measure environmental activists say could reduce air pollution in the smog-ridden city. In a first of its kind in India, trucks entering the capital will have to pay an entry charge of Rs700 or R1300 ($20), depending on their size. Trucks are held responsible for an estimated 30 per cent of vehicular pollution in New Delhi, and the environmentalists believe the tax will reduce their number. ‘We’ve just had a major victory,’ said Sunita Narain, director-general of New Delhi’s Centre for Science and Environment, after the Supreme Court issued the order on Friday to impose the charge.” The Financial Times (FT.com). Read it on delhiair.org.